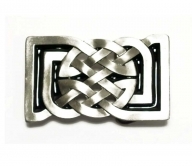 Belt with interesting and trendy, silver and steel coloured, nickel-free buckle. 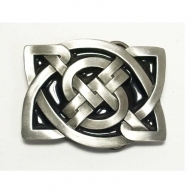 This elaborately made buckle has a silver frame and a steel coloured inlay and is perfect for jeans and casual wear. The buckle is approx. 8 cm long and approx. 6 cm high. Available in combination with our 5 leather strap colours and in all waist sizes up to 170 cm.